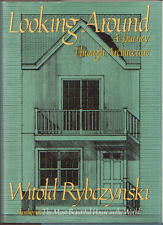 When I came across Looking Around: A Journey Through Architecture at a book sale earlier this year, I knew I had to buy it, not just because it was only $3 for a hardcover, but because Witold Rybczynski writes such compelling architectural criticism. I remember getting quite absorbed in his earlier books, Home and The Most Beautiful House in the World. Looking Around: A Journey Through Architecture is divided into three sections: Houses & Homes (a treatise on the history of houses and how domestic spaces affect us and define our culture), Special Places (airports, museums, malls and shrines), and The Art of Building (the history of architecture and its feuding architects). At times, particularly in the final section, Rybczynski's writing does devolve a bit into what I call begatedness (name listing reminiscent of the Bible's endless so-and-so begat so-and-so lists). But these paragraphs are relatively easy to skim over (as I did) and they did pique my curiosity enough to do a little back-checking into some of the more prominent names. This is how I discovered that Ludwig Mies van der Rohe, who coined the term "less is more", was the architect whose clean-lined glass and steel designs ushered in the era of modernity. His buildings never fail to fill me with a sense of peace. Rybczynski wrote this particular book over twenty years ago, and while it is predictably dated in places, at other times it proves to be remarkably prescient. He predicts, for example, that unrealistic expectations for housing prices, coupled with increasingly easy financial credit, could lead to dire consequences in the housing market. Which, of course, is exactly what happened when the American housing market crashed a decade later. Architecture being so visual, it would have been nice if this book had contained some photographs. But even lacking the coffee table aspect, Looking Around: A Journey Through Architecture will interest anyone with an interest in the sociological implications of how we design buildings. Worth a read. With a handle like Ludwig Mies van der Rohe, no wonder he was keen on simplicity. This book would have been a perfect Christmas gift for an architect friend of mine. And here I thought I couldn't top that Canadian Tire gift card. John,the really weird thing is that Mies van der Rohe actually changed his name from Maria Ludwig Michael Mies. But no matter what you call him, it's still hard to beat a Canadian Tire gift card.